When we remodeled our townhouse a few years ago, we chose Caesarstone quartz countertops in Organic White. 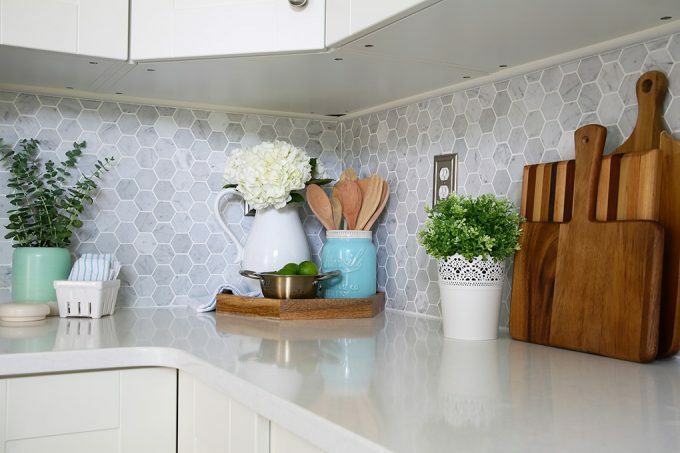 We loved the look of them, and they were easy to clean and maintain– we were sold on quartz! Since we loved the quartz counters in the townhouse so much, we decided to install them in our new house as well, this time choosing Caesarstone London Grey. Quartz is a man-made product, and super hard resin is incorporated into the surface which makes it almost completely non-porous. The advantage of this over something like granite is that it’s stain resistant, harbors less bacteria, and doesn’t need to be sealed. Maybe it’s because our townhouse had so much less countertop area (and also because we use our kitchen island in the new house constantly! ), but it seems like our new quartz countertop has been more difficult to keep clean. Simply wiping them down with a wet rag leaves a lot of streaks and grease spots. After researching and experimenting for a few weeks now I’ve found a “system” for keeping our polished quartz countertops sparkling clean without any fingerprints, dirt, or streaks. The best part is that it’s incredibly simple! On a daily basis, we simply wipe down the counters using a rag with warm water and a mild soap, like Dawn dish soap. Then we are sure to rinse the surface thoroughly– don’t skip the rinsing step or your counter surface may look streaky– and dry it completely. For harder stains, such as food coloring or juice, Caesarstone recommends using Soft Scrub Liquid Gel with Bleach, specifically the one in the green bottle (which is the only product in the family of Soft Scrub cleaners that they recommend). If we’re looking to avoid the chemical nature of bleach, an alternative that we’ve found is to use a 50/50 mixture of vinegar and water. Again, we are sure to rinse the surface thoroughly with water after using the mixture and then drying it completely. As always, check with your quartz manufacturer for their specific recommendations. Quartz is incredibly resilient so you don’t have to baby it. Just make sure you don’t use any abrasive sponges or cleaners; it could dull the polished surface of your quartz countertops. 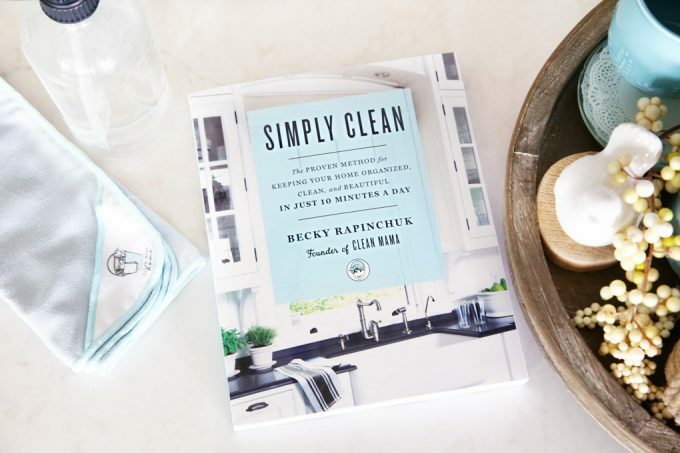 Becky’s book is packed full of simple tips, tricks, and strategies for developing routines that will leaving your home sparkling clean without taking up a lot of your precious time. Along with a one-week “Cleaning Kickstart,” she also includes a 28 day cleaning challenge to turn cleaning into a habit, a monthly method for honing in on those organization trouble spots, and tips for cleaning and organizing just about anything! 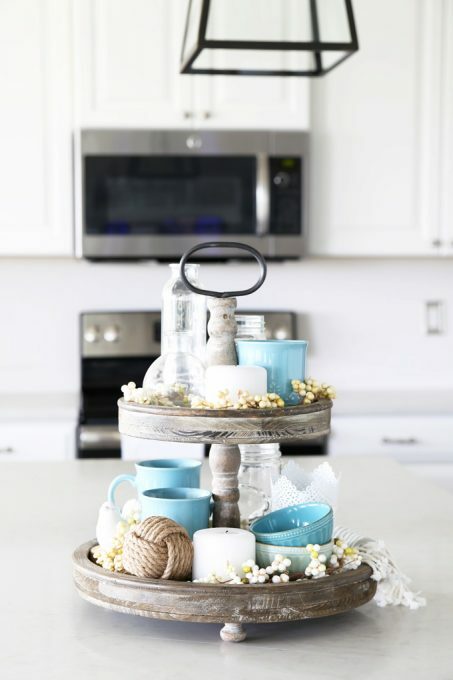 I love that Simply Clean takes the overwhelming tasks of cleaning and organizing and breaks them down into smaller, more manageable steps for every day. And since I’m such a routine girl, Becky’s method is perfect because I can fit it right into the other tasks I’m already doing as I’m going about my day. You can learn more about Simply Clean and snag your copy here. Thanks so much for following along, friends! Have a wonderful week! Good idea, guys! I wonder if this method can be used for marble tiles.. Our kitchen and bathroom are made of marble and I’m really struggling to clean it! Hmm… I’ve never had marble countertops, so I’m not sure! Good luck with them! I found that a mix of white vinegar, water and the juice of a lemon makes a very good cleaner for marble surfaces. Do NOT clean marble with vinegar or any other acidic cleaner- Marble is mostly calcium, and is easily etched or pitted by acids, even as mild as vinegar or citrus juice. Mild cleaners such as Dawn or other clean-rinsing dish soaps should be fine. Also remember to keep your marble sealed and renew the sealant often. Grest tip! I love my quartz countertops too, but haven’t found a cleaner I love. So I’ll pull out my always handy window cleaner and give it a try. Hi Guys I use window cleaner for lots of jobs around the house.,I use it on the tiles in my kitchen and bathroom. My best discovery was to spray it on the shower screen, leave for 10 minutes and use a light scoured then rinse off with water. I am shower screen obsessed and have found this to work wonders. Thanks so much for sharing that tip, Amanda! Hope you’re having a wonderful week! Ooh I have never had granite, believe it or not, but it is worth a shot! Hope you’re having a great week, Brittany! I found a wonderful home made granite cleaner recipe that leaves my kitchen countertops shiny and looking brand new. Get yourself an empty generic spray bottle. Combine 1/2 cup rubbing alcohol, 2 cups water, 8 drops dish soap, and 4 drops scented lavender (optional). Shake before using. Spray on and wipe with a paper towel. If counters are particularly bad, I use a soapy sponge and warm water to wipe them down before using he cleaner. Hope this helps! Can you tell me what window cleaner you use. the link is not hooking up when I click on it. Thanks! Whatever is on sale, lol! We’ve done it with several brands, and it’s worked well for us! We were actually using Aldi’s brand for a while, and it worked well. I recently made my own glass cleaner using this recipe: http://creativesavingsblog.com/cleaning-organizing/homemade-window-cleaner-with-vinegar/ and have liked it too! This is great! 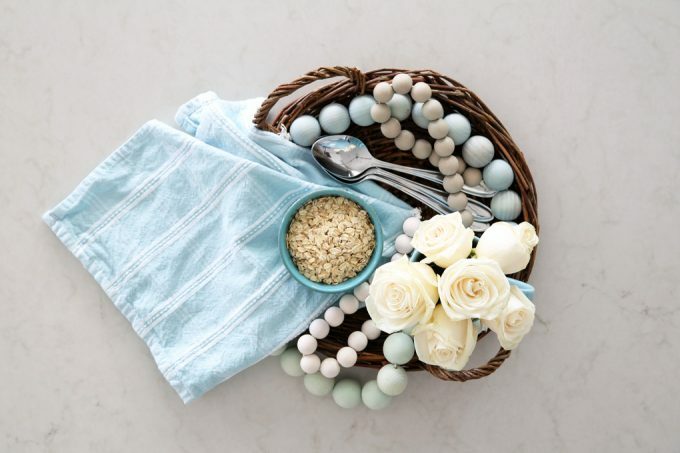 I just ordered quartz (Silestone – Stellar Snow) and this will come in handy! So glad it will be helpful, Randa! Thanks for sharing! Quartz is definitely one of the easiest stones to maintain, which makes it a favorite! we were told NOT to use products like windex, and tried everything ; peroxide, vinegar, denatured alcohol. nothing worked. Until I just thought what about ammonia? it worked! took the stains , streaks, grease smudges, cup marks, you name it. I was wrapping some ribs in foil on the counter and the foil left grey marks on the quartz. like a pen streak. I used a non-abrasive polyester scrubbing pad that I got at an auto parts store (they sell them for deep waxing and oxidization of auto paint on your car). Now I keep a small bottle of it and the scrubber under the sink. Follow the cleaning with a wet towel to remove residual ammonia, and follow that with a dry towel to dry and lightly buff. there you go. I know windex has ammonia in it , but it may not be enough to clean a stain or colored scratch from things like foil, utensils, ink pens, or pots/pans and ceramic dishes. All of those leave a light stain that looks like a scratch , but its actually just a stain from whatever contacted the quartz. Thanks so much for the tip, Chuck! Have a great day! Thanks for the tip. I recently had quartz counters installed. I have a pen stain which i can’t get off and also an ash from a candle made a grey stain. I was able to get that off with Cornerstone cleaner. I tend to baby them. I set a glass down with red wine in it and in a few seconds there was a red ring. Luckily it came off i think because i saw it immediately. Sometimes i wish i had gotten the granite. It seems quartz streaks, and leaves smudges behind depending on what cleaner is used. I have found that glass cleaner (ammonia free) works good for every day cleaning on my quartz, but to really remove those greasy looking streaks I fight grease with grease! After a good cleaning I use Weimann’s stainless steel cleaner. ALL streaks are gone and the shine is incredible! 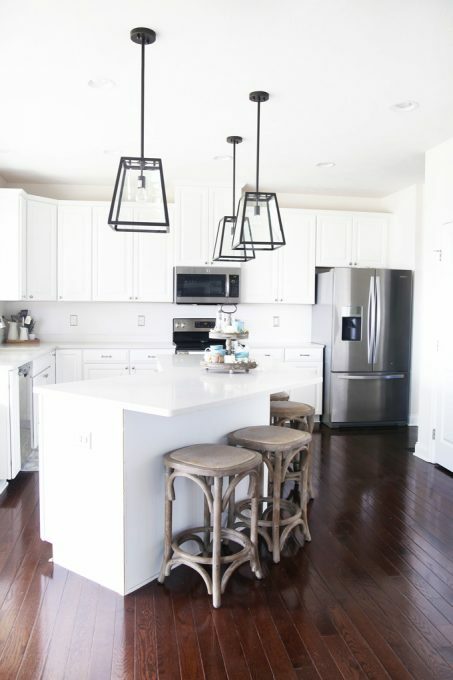 Any comments on hot pans and quartz countertops? I’m accustomed to putting anything done on my granite and not worrying about it; but now we are considering quartz, and the manufacturers all say to use trivets. Thoughts? Hello! We love our new quartz countertops. They were installed less than a month ago and have already had a mishap I’m hoping you can help me with. We had a candle burning and it was knocked over. It had been burning for a while so there was quite a bit of the melt on countertop. I let the wax cool then scrapped it up with a none metal spatula. It got a lot of it up but a thin layer of residue/wax remains. What do you suggest to get all of the wax off so it does not ruin the countertop and that area is smooth once again? Thank you! Oh no! We haven’t had that issue, so I’m not sure what the best way would be. I would reach out to the manufacturer of your quartz slab and ask for their recommendations. They should be able to point you in the right direction! I have been looking for quite sometime on how to clean quartz counter tops.. This came timely. you have put out excellent information regarding the same. Totally understand! Some days can definitely be a challenge!